It’s no coincidence that Costa Rica means Rich Coast in Spanish. Mother Nature has endowed the country with a virtual treasure trove of beaches, each one of which has its own special charms. Those coastal jewels range from sheltered coves where a crescent of white sand separates the verdure of the rainforest from the ocean’s aquamarine waters, to long beaches washed by frothy surf and lined with lanky coconut palms. Within that variety and natural exuberance are the ingredients needed to fulfill every traveler’s tropical fantasy. Countless stretches of sun-swathed sand await you on Costa Rica’s 762 miles of sinuous coastline, spread between the Pacific and Caribbean. Most of those beaches are backed by forests that contain a myriad of rare flora and fauna, while submerged off some lie such marine wonders as intricate coral formations and kaleidoscopes of brightly colored tropical fish. And in addition to their own attractions, many of those beaches can serve as your base for such varied activities as white water river rafting, horseback riding, deep sea fishing, skin diving and other outdoor adventures. 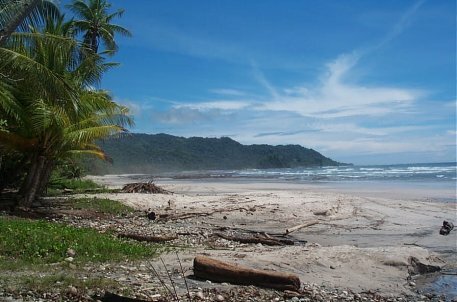 Perhaps more important, Costa Rica’s beaches provide the perfect conditions for doing absolutely nothing, which is an essential part of any vacation. Such natural attributes as soft ocean breezes, impeccable blue skies, rustling palm fronds, warm sand and the rhythmic crashing of the surf combine with amenities tike cool beverages, tropical music, fresh fruit and an abundance of seafood, elevating leisure to the level of a science. The nation’s tradition of hospitality is complemented by a modern transportation system and a cornucopia of coastal accommodations to ensure comfortable beach vacations for all. 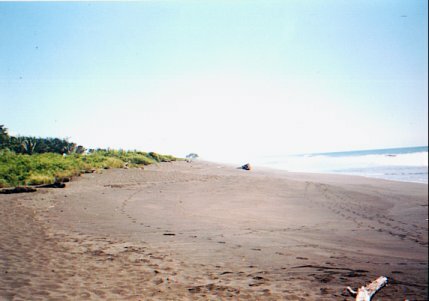 Costa Rica’s beach selection is simply mind boggling, certainly more than you could visit in several vacations. The following overview of the country’s “playas”, as beaches are called in Spanish, is consequently intended to help you decide which of those coasíal treasures you would like to discover for yourself. No región represents Costa Rica’s coastal opulence better than the Northwestern province of Guanacaste. The driest part of the country, Guanacaste is a popular destination among sun worshippers of all types. Its beaches run the gamut, from pristine coves set deep within the wilderness of a national park, to modern resorts complete with four-star hotels, gourmet restaurants and charter boats equipped for sportfishing and other aquatic adventures. Guanacaste’s wind-swept beaches, separated by rocky bluffs and backed by patches of tropical dry forest, evoke what southern California’s coastline might have looked like a century ago. But unlike California, the forests of Guanacaste are home for troops of howler monkeys and flocks of parrots. Stretching south from Costa Rica’s border with Nicaragua, down the western edge of the Nicoya Península, Guanacaste’s coast is divided by rocky points into dozens of beaches. Those on the Santa Elena Península are wild and isolated, visited only by adventurous nature lovers, dedicated surfers, and nesting sea turtles. The Gulf of Papagayo, to the south of that península, features more accessible beaches, many of which slope down into the tranquil waters of Culebra Bay. That bay’s calm and crystalline waters offer excellent conditions for swimming, skin diving, windsurfing and other aquatic diversions. Some of the country’s newest luxury hotels overlook Culebra Bay from such beaches as Hermosa and Panamá. Playa del Coco, the region’s principal port and a colorful little fishing town, is set in a deep cove with a long beach of dark sand and calm waters, while Ocotal, to the south, lies in a similar but considerably smaller bay. 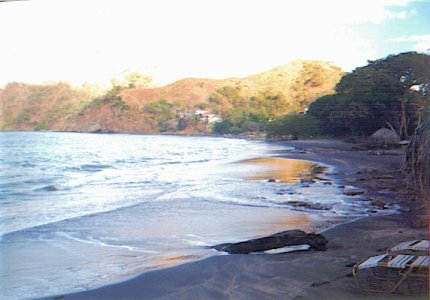 If you follow the coast south from the Gulf of Papagayo, the beaches become more exposed the Pacific’s whims, which means the sea can resemble a swimming pool one week and raise waves large enough to please expert surfers the next. At such serene spots as beaches Pan de Azúcar, Potrero, Brasilito and Conchal, you won’t have to share the beach with crowds of tourists, since relatively few accommodations complement the coastal beauty there. Playa Flamingo’s white sand beach is attractive enough to justify the handful of hotels that overlook it, but the modern fleet of charter boats docked in its marina are as much of a draw for many people. One of Guanacaste’s major sportfishing spots, Flamingo provides anglers access to some of the best sail and marlin fishing in the world, and is consequently the site of an annual sailfish tournament. Tamarindo, to the south, features a long swath of fine packed sand backed by the best selection of notéis and restaurants available in the región. A popular spot among surfers, Tamarindo has several equally impressive beaches nearby, such as Playa Grande, an important sea turtle nesting beach, and Junquillal, a long stretch of sand bordered by forest with accommodations of its own. As you head south from there, the roads get rougher and the hotels grow scarcer, but the scenery doesn’t suffer in the least bit. Nosara is a spectacular spot that combines the charms of long, empty beaches with the wildlife that inhabits patches of rare tropical dry forest. Such beaches as Garza, Carrillo and Islita offer similar combinations of coastal and sylvan beauty, while the pale, hard-packed sand of Sámara is complemented by a wider selection of accommodations, and is a little easier reach. Island refuges, rainforest reserves and white water rivers are just a few of the natural attractions available along the country’s Central Pacific Coast. The port town of Puntarenas, due west of San José, is the gateway to the Gulf of Nicoya and the southern tip of the península of the same ñame. Though the beach that stretches along the city is a bit urban, the coast by the mouth of the nearby Barranca River offers a more natural setting, and excellent conditions for surfing. Ferries cross the Nicoya’s gulf from Puntarenas, passing rugged and wild islands, and providing access to the southern tip of the Nicoya Península. 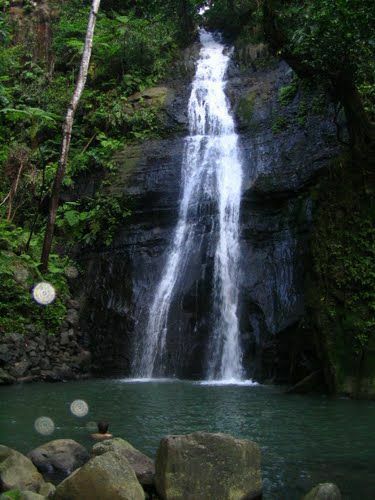 An array of natural assets includes calm seas, gorgeous beaches, rainforest reserves and waterfalls. The road that follows the coast south from Puntarenas not only winds past some impressive panoramas, it leads to two of the country’s most popular beach resorts: Jaco and Manuel Antonio. The palm-lined, sugar-sand beach of Jaco was one of the first in Costa Rica to be developed as a resort, and it consequently boasts an abundance of hotels, restaurants, shops and services. A popular spot with surfers, who are drawn there by its consistent waves, Jaco lies near several natural attractions that are worthy excursions for travelers who tire of beach life. Nearby you will find Punta Leona, which includes an extensive forest reserve. Further to íhe south lies the equally popular resort of Manuel Antonio, which is famous for its unforgettable coastal scenery, exuberant tropical nature and ampie selection of outdoor adventures. Manuel Antonio National Park protects beaches, rainforest, reefs and islands, but there is also plenty of beach and forest outside the park that is easy to explore, and with pastime possibilities that include sportfishing, horseback riding, white water rafting, snorkeling, sea kayaking, sunset cruises and a bit of nightlife, you’ll never be at a loss for what to do. waterfalls to complement the flora and fauna. 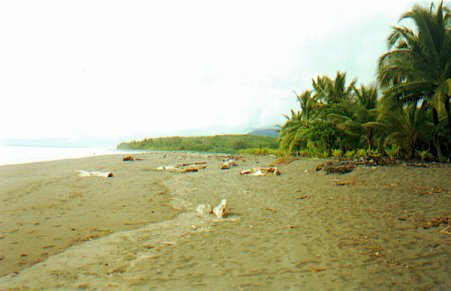 The coast and islands south of Uvita Point are protected within Ballena National Marine Park, which was named for the whales that are occasionally seen there. There are plenty of small lodges scattered along the coast and tucked into the hills between Dominical and Coronado, offering a choice of accommodatiorts that caters to all tastes and budgets. 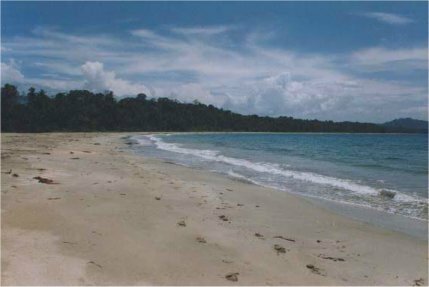 The Osa Península, further to the south, is an even wilder area, with beaches that have hardly changed duríng the last five centuries. Corcovado National Park covers one third of the península, and if you make the effort to hike down one of that park’s secluded beaches, you’ll be just as likely to encounter monkeys and scarlet macaws as you are another human being. About a dozen nature lodges are located along the coast near Corcovado, in such wild and isolated enclaves as Drake Bay, to the north of the park, and Matapalo, on the peninsula’s southern tip. Across the Golfo Dulce from the península are more isolated nature lodges and tranquil beach towns set between tropical forests and marine wonders. Zancudo, located within the gulf, provides opporíunities for sportfishing and nature observation, while Pavones, on the southern edge of the gulf’s mouth, is a legendary surfing spot that has plenty to offer bird watchers and botanists as well. The quantity of beaches on Costa Rica’s shorter Caribbean Coast may not rival that of the the Pacific, butthe region’s idyllic swaths of sugar sandbordered by coconut palms and jungle constitute some of the country’s most enchanting coastal scenery. The Caribbean is also an area of exceptional natural wealth, since beyond the rows of palm trees you can often find rainforest that is inhabited by troops of monkeys, legión, of tiny lizards and countless bird species. And submerged off several points are extenstve coral reefs that include such intriguing life forms as colorful sponges, sea stars, moray eels and eagle rays. The ever verdant región is also the cradle of Costa Rica’s Afro-Caribbean culture, which implies different cuisine, music and language than what you’ll encounter in the rest of the country. The amazingly straight northern half of that coast resembles an endless palm-lined beach broken here and there by a river mouth. Though dangerous currents make the area unsafe for swimming, its exuberant vegetation and languid waterways teaming with game fish make it a popular destination for nature lovers and sport fishermen. Tortuguero National Park protects one of the world’s most important nesting beaches for the endangered green sea turtle, as well as vast expanses of tropical forest traversed by rivers and canals. While boat trips down those waterways are excellent opportuniíies for spotting some of the local wildlife, guides can take visitors down the beach at night from June to October, for the unforgettable experience of watching a sea turtle nest. Quiet fishing communities, coral reefs and rainforest reserves complement the picturesque beaches of the southern Caribbean Coast. Not only are those beaches excellent candidates for travel posters and postcards, they feature safe conditions for swimming and snorkeling when the waves are small. Several points in the area are surrounded by large coral reefs that are extensive enough to keep skin divers exploring for hours on end. Cahuita National Park was created to protect the country’s biggest coastal coral reef — a vast marine garden composed of amazing colors and life forms — but the park’s forests, beaches and estuaries comprise comparable biological diversity. The area around Puerto Viejo and Manzanillo offer equally impressive combinations of marine life and tropical forest, and as is the case with Cahuita, the local culture is an added attraction for visitors. The port city of Limón and the fishing towns of Cahuita, Puerto Viejo and Manzanillo were founded by immigrants from some Caribbean islands, and the consequent Afro-Caribbean heritage makes the area an interesting switch from Costa Rica’s predominant Hispanic culture. As if the Costa Rican mainland didn’t have enough beaches, the country also has several islands that are well worth visiting. Tortuga Island, a splendid spot near the tip of the Nicoya Península, is one of the most popular destinations in the country. One-day tours head their regularly out of San José and several Central Pacific beach resorts. Tortuga Island boasts a fortune in natural assets, including a flawless white sand beach, turquoise water, submarine wonders and tropical dry forest. Caño’s Island, a biological reserve near Drake Bay, was considered sacred by the country’s pre-Columbian inhabitants, who buried their chiefs there, and left behind important artifacts. Today the crystalline waters that wash against its cliffs and beaches hold the big attractions, since the marine life that abounds around the island draws skin divers from far away. Other popular dive spots are Santa Catalina Islands and the Murciélago Islands, which lie off the northwest coast, and can be easily visited from resorts in the Gulf of Papagayo region. The country’s greatest dive spots, however are located some 330 miles southwest of the mainland, at legendary Coco’s Island, which is said to be where Robert Louis Stevenson set his novel Trerasure Island. An uninhabited isle covered with thick jungle and surrounded by an incredible array of marine life, this island is protected within a national park, and is regularly visited by commercial yachts offering multiday scuba diving excursions.